–Mae Whitman retweeted HitFix’s article speculating about why Independence Day 2 recast her, which basically confirms their theory that she wasn’t Hollywood hot enough. Total BS, especially since The Duff overperformed and solidified her status as bankable. 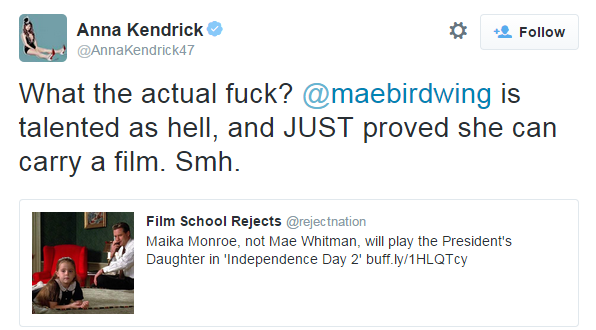 I’m with Anna Kendrick on this one. -How can you not love Mae when she wears a suit covered in naked ladies? –Ian Somerhalder’s wedding guests included Vampire Diaries’ costars Kat Graham, Paul Wesley and Matt Davis. If Nina Dobrev ever had an excuse to bail on an event, it was this one. -Why would Susan Sarandon agree to be on a reality series? WHY? -I adore Kristen Wiig‘s rambling, in-character (but not really) appearances on Fallon. -NBC is pulling a Netflix and is going to make the entire season of David Duchovny‘s Aquarius available online after the first ep airs this summer. This is probably only exciting to people who’ve never tried to watch anything on NBC.com. –Chris Evans surprised the crap out of Scarlett Johansson on Ellen and it was hilarious. Thank god. That press tour needed a win. -Weird: we nearly had John Krasinski as Captain America and Emily Blunt as Agent Carter. –Ben Affleck tried to creep around the Toronto set of Suicide Squad unnoticed. It didn’t work. -This is a great story about how Hollywood keeps women out (even though it doesn’t depict George Clooney in the best light). –Kevin Spacey was owned by a 5-year-old in a presidential trivia challenge on Ellen. -Can someone please explain Clickhole to Russell Crowe? ‘Cause this is getting embarrassing. -I don’t understand how Teenage Mutant Ninja Turtles 2 keeps casting people I love. I don’t have to see this movie, do I? Please Hollywood, don’t make me see this movie. -The custody battle between Rosie O’Donnell and her estranged wife over their 2-year-old daughter is getting ugly. -Depressing: Nicholas Brendon (Buffy’s Xander) continues to break our hearts. There’s a warrant out for his arrest in Florida. –Jaden Smith shared a moment with Owen Wilson and tweeted about it because celebs are just like us. –Blake Lively’s backup plan is to go to Harvard Business School. Mwahahaha! -No surprise here: Oprah just pulled the plug on Dr. Oz’s radio show. -Wait, wait, wait — the new Emma Stone/Ryan Gosling movie is going to be a musical? I think I just got the vapors. -Speaking of swoonage, how am I supposed to handle a double dose of Tom Hardy in the same film?! -The trailer for Cameron Crowe’s Aloha, starring Bradley Cooper, Bill Murray, Rachel McAdams and Emma Stone, looks very Cameron Crowe-y. I can’t decide if that’s a good thing or not. Did Vivica A. Fox Just Out 50 Cent?